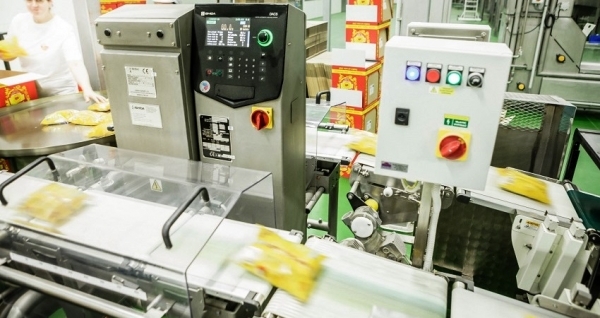 Equipment such as checkweighers and X-ray systems can take on multiple roles as part of a fully integrated packing line, explains Ciaran Murphy, quality control business manager, Ishida Europe. Quality is a driving force throughout the food industry. Retail customers are looking for the highest standards in the products they put on their shelves. Consumers, with their increasingly sophisticated and adventurous tastes, are becoming equally demanding about what they expect from their purchases. Manufacturers have to ensure quality at every stage of their operations so that only properly packed and presented products find their way onto supermarket shelves and into people’s homes. A key part of this is the implementation of effective monitoring and inspection processes at the end of the packing line. At the same time, fierce competition in many key markets has highlighted the need for manufacturers to maximise efficiencies throughout their factory to deliver increased throughput and minimise waste. And as part of this process, many packing line machines have been enhanced and developed to provide a wider role, where their primary function is extended to offer additional support to the operation. The checkweigher is an excellent example of this. Its main function remains to deliver a final weight check and evidence that all packs leaving a factory are meeting the relevant legal weight requirements. As part of this, the technology has continued to be developed over the years. For example, latest models feature new loadcells that are able to switch between two weighing capacities and graduations, thus giving the checkweighers the flexibility to handle a much larger product range, while still achieving the desired accuracies. Other recent developments have taken into account the busy working environments of most factories with features such as a Dislocating Force Limiter, which automatically disconnects the weigh sensor from the weigh conveyor should sudden excessive force be applied (for example during cleandown), and an easy turn-and-press operating dial, which eliminates the potential for operator error and can be used while wearing gloves. Open-frame designs and quick-remove conveyors prevent bacteria traps, and enable fast and thorough cleaning with reduced downtime. At the same time, today’s modern checkweighers, benefiting from the huge advances in software, now offer the potential to contribute to production planning and monitoring. So, as well as the ability to catch individual weights, they can also be used to compile detailed reports and assessments of the efficiency of the production line. Checkweighers can transmit weight data by batch, shift, product or machine to produce fully customised reports—both real time and historical—which depict crucial parameters such as for downtime, OEE (Overall Equipment Efficiency) of the production line, and product giveaway. These reports are fully customised to meet an individual manufacturer’s needs and can be instrumental in identifying cost saving opportunities, minimising product giveaway and improving production efficiencies to further enhance the overall profitability of the line. In food packing applications, for example, this analysis function may highlight the fact that a product, be it a beef burger or a chocolate bar, is consistently over its target weight. This can help to indicate a potential problem in the production process and ensure that action is taken to rectify this sooner rather than later. What’s more, latest technological developments can now allow this information to be gathered from any number of individual checkweighers—up to 100 for the very latest systems—into a single secure database. 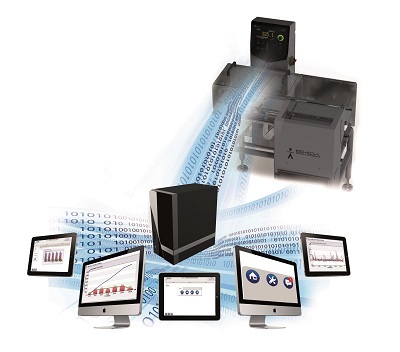 This enables a factory’s complete performance to be monitored and assessed. This same technology also takes account of modern working practices, allowing all the information to be accessed remotely and meaning managers can be monitoring operations from anywhere in the world on a laptop or a mobile phone. While checkweighers can be combined with metal detectors for enhanced quality control monitoring, modern producers are typically looking for detection of a wider variety of foreign bodies in packs and this is why X-ray technology is becoming particularly popular. X-ray inspection offers huge flexibility and versatility in terms of its inspection capabilities, picking up inconsistencies in materials, in a pack, or in a flow of product passing a given point. It can detect pieces of bone, stone and glass and metals such as iron and stainless steel, as well as dense plastics. The minimum size of particle that can be detected varies from one material to another, depending on the size, density, shape and the type of packaging or product, as well as the precise capabilities of the X-ray system. One of the most important factors in an X-ray unit’s versatility is that, unlike metal detectors, these can also detect a full range of inconsistencies and foreign bodies in products packed in foil or metallised film. Another benefit of the technology is that X-ray systems can work undeterred in even the harshest of environments, such as humid and wet atmospheres and extreme hot and cold temperatures. Equally significant, just as checkweighers can offer an increased role on the line, so too are X-rays able to deliver more than simply spotting unwanted contaminants. Product quality can be about far more than foreign bodies in packs. Poor presentation, non-uniform product or incomplete packs can be equally damaging to brand reputation. X-rays are therefore equally ideal for detecting a range of inconsistencies that can also have an adverse effect on quality standards. For example, the technology can identify voids and broken, undersized or missing items in packs; it can spot deformed product and packaging. Under-filled compartments in ready meals, product with cracks, and missing metal clips are further examples of imperfections that can also be detected. In addition, X-ray inspection can perform a number of other functions, such as weight estimation. 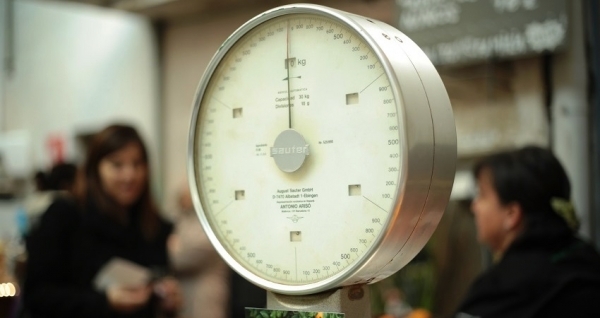 One of its advantages in this area against a more traditional weight check using a checkweigher is its ability to spot a problem which weighing alone cannot detect. If a pack is supposed to contain a set number of items of approximately the same size and weight but one piece is considerably over weight and one considerably under, then the total weight of the pack may still be correct but the end-consumer will not be satisfied with the overall pack contents. 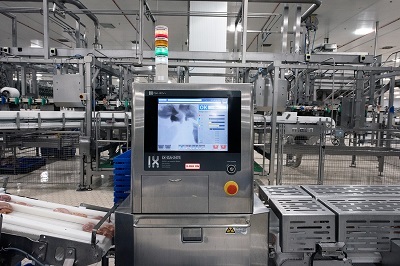 This high level of quality control extends to the ability to offer full traceability—for example, in the event of a complaint, ERP (Enterprise Resource Planning) or other data systems linked to X-ray inspection can enable retrieval of the X-ray image of a particular pack, establishing beyond doubt whether or not it contained a foreign body or showed a quality issue such as a missing item. It is also very useful for false claims as the system can capture every single image. Today, there is a wide range of X-ray machines available. Choosing the most appropriate model will depend on the requirements of each producer and its customers, but in terms of consistency in detection, the right level of sensitivity is essential. Companies therefore need to set levels (i.e. minimum particle sizes) for the foreign bodies that they most need to guard against. At the same time, there is no need to specify a machine with many sophisticated features that add capability that a company will never use. Size is another important consideration. Any system has to deliver an inspection beam that will accommodate the largest products routinely produced on the line. However, unless the need exists to future-proof the production line against larger packs, anything larger will escalate the price for no great return. Some contaminants can be more challenging to spot than others. For low density items, machines that have the ability to vary their kV and mA can control the photons passing through the product to provide a clearer difference between the product and the foreign body. Imagine taking a photo with a bright flash—too much light gives over exposure, whereas the correct level of light will give a sharp image. 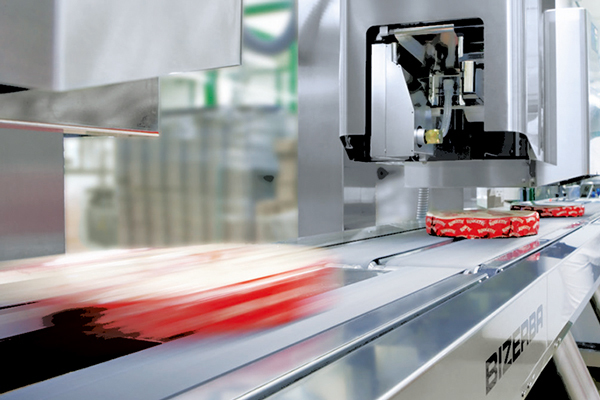 Pinpoint accuracy, maximising efficiencies and effective detection are all critical to a well-functioning packing operation—but what has also become clear over the years is that while the machines that deliver these benefits can operate very successfully in isolation, they will function even better when included as part of a fully integrated packing line, tailored to the precise needs of each application. 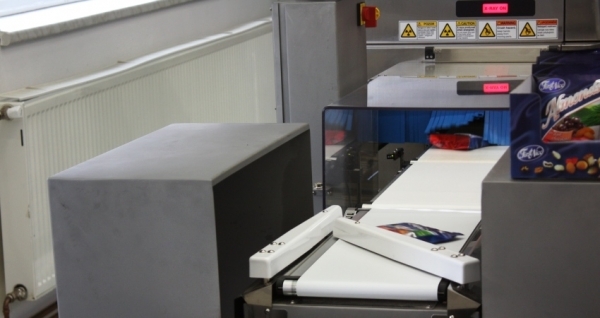 Checkweighers and X-ray systems can therefore be linked to all other upstream and downstream machines such as tray denesters, multi-head weighers, tray fillers and sealers, bag makers, seal testers, label inspection and end-of-line packing equipment to ensure maximum throughput and efficiency. For this to happen most effectively, it is vital that manufacturers and their suppliers seek to establish mutually-beneficial long-term working partnerships. In this way, the machinery supplier can be involved in the early stages, developing a complete solution that minimises costs (in terms of reduced manpower and energy requirements, and minimal downtime) while delivering high throughput. Just as important, including consideration of the packing operation in the early stages of a launch plan will ensure that the line is fully fit for purpose rather than finding out at the last moment that a new pack design cannot be packed efficiently at high speed. Such close co-operation can also help machinery manufacturers to design equipment that is future proof and able to be adapted quickly to handle new products or pack types, or be combined effectively with many other packaging machines. 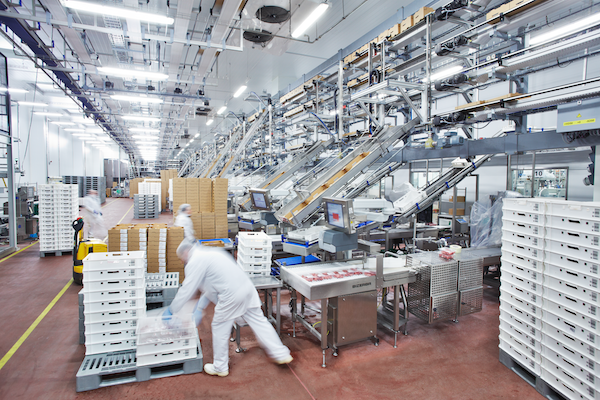 And in this way, food processors and packers will be able to maximise the multi-purpose roles of their equipment to ensure the highest levels of quality and efficiency throughout their packing operation.